ESD - For use on Arcade Machines. High Quality Product. If you are changing a mechanism from tokens to quarters, or need more quarter inserts for an ESD mechanism, these are just what you are looking for! This is a set of 4 inserts. Replacement Parts. This insert is designed to allow only quarters to pass through the coin mechanism. ESD - When the mechanism is pressed in to deposit coins, this is the spring which pulls the mechanism back out. Replace it with this high-quality part! Package of 12. Esd return spring - set of 12 This is the return spring for ESD coin mechanisms. This is the return spring for ESD coin mechanisms. When the mechanism is pressed in to deposit coins, this is the spring which pulls the mechanism back out. If your mechanism is not returning back out properly, it is most likely the spring. ESD . - Replacement Parts. This is the return spring for ESD coin mechanisms. When the mechanism is pressed in to deposit coins, this is the spring which pulls the mechanism back out. Set of 4. Package of 12. It's always great to have a supply of these inserts! This is a set of 4 inserts. These blockouts are great to maintain proper function of the mechanism, such as pennies and dimes, as smaller objects, cannot be shoved into the slot, causing a blockage. High Quality Product. This insert is meant to block a coin slot from use in ESD vertical coin mechanisms with pricing varying from the full amount. For use on Arcade Machines. More information about ESD . ESD - High Quality Product. This insert is designed to allow only quarters to pass through the coin mechanism. If you are changing a mechanism from tokens to quarters, or need more quarter inserts for an ESD mechanism, these are just what you are looking for! This is a set of 2 inserts. Set of 2. This is the return spring for ESD coin mechanisms. When the mechanism is pressed in to deposit coins, this is the spring which pulls the mechanism back out. Set of 4. High Quality Product. Package of 12. For use on Arcade Machines. For use on Arcade Machines. Replacement Parts. Replacement Parts. 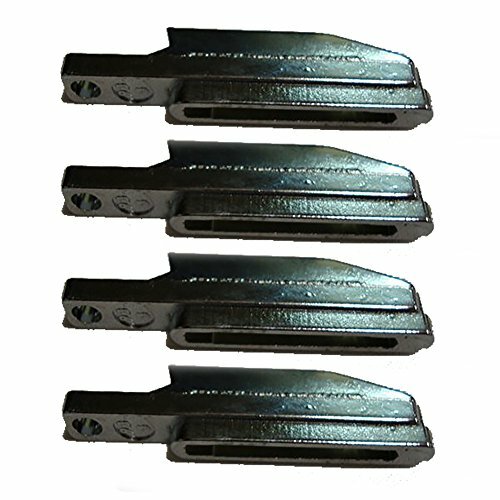 ESD - Vertical 8 coin acceptance all steel security gate and solid metal bridge Instant price changes, 0 - $2. 00 up and down pricing one step price changes up or down in seconds w/o disassembly blanks and inserts not included Rugged heavy duty design Fits all existing extensions and machines Durable metal casting with high polish Chrome finish*Factory preset to $2. 00 package of 12. 0 - $2. 00 up and down pricing. For use on Arcade Machines. Set of 2. High Quality Product. This is the return spring for ESD coin mechanisms. When the mechanism is pressed in to deposit coins, this is the spring which pulls the mechanism back out. Set of 4. Factory preset to $2. 00 For use on Arcade Machines. ESD Vertical 8 Coin Chute - . High Quality Product. Replacement Parts. Replacement Parts. Low Cost Mfg. - Replacement Parts. For use on Arcade Machines. Parts for price change sold separately. High Quality Product. Package of 12. Factory preset to $2. 00 Face plate dimensions: 3. 375" x 2. 875". 0 - $2. 00 up and down pricing. Set of 2. 1. 50 coin Slide Decals. For use on Arcade Machines. Replacement Parts. This is the return spring for ESD coin mechanisms. When the mechanism is pressed in to deposit coins, this is the spring which pulls the mechanism back out. Set of 4. Rugged heavy duty design. High Quality Product. More information about Low Cost Mfg.